BT says new price caps on wholesale services provided to competitors could hamper its ability to invest in the next generation of super-fast broadband networks. Normally, when competitors squawk about wholesale prices, it is because they have determined those prices are too high to allow making of a profit. When the wholesaler complains, it normally means the facilities provider doesn't think it can make enough money. If both buyers and sellers complain, regulators probably have got the prices just about right. Some observers will say that such a response by an incumbent is nothing more than typical posturing to get a better deal. That's an apt observation. Still, some note that there are unusual stresses. Ofcom is refusing to allow the company to include costs of funding its Openreach pension obligations in the rate base. Openreach is the entity that provides wholesale voice and broadband access to competitors. BT has to contribute an annual £525m into its pension fund over the next three years, one way or the other. Last year BT announced plans to spend £1.5bn putting a fibre-optic network capable of delivering broadband at almost five times the speed of BT's copper network within the reach of 10m homes by 2012. Since then, not only has the economy hit a wall, but BT Global Services also has suffered significant losses, leading to major layoffs. Some think that means the broadband upgrade will be slowed, in the absence of a rethinking of wholesale rates. Ever wonder why so many market forecasts you read these days are for where a particular market will be in 2013? The rapidly mobile M2M (machine-to-machine) market, for example, suffered a setback in 2008 with growth in cellular module shipments stalling overall compared with 2007, according to Beecham Research. The decline was caused by projects being cancelled or postponed, particularly in the second half of 2008, Beecham says. Nevertheless, Beecham sees growth returning by 2010 and reaching annual module sales of over $2 billion by 2013. The reason is that five years is about as far as any rational forecaster dares see into the future. And the last year for which full-year data are available is 2008. Go out five years and you reach 2013. Next year you'll be reading about where markets for specific products and services will be in 2014. Same reason. Green Shoots or Grasping at Straws? With the caveat that nearly all financial information is backward looking, corporate earnings performance of companies in the S&P 500 for the first quarter of 2009 has been "less bad than expected," according to Thomson Reuters. With 91 percent of companies having reported first quarter earnings, the blended growth rate for the broad market stands at -35.6 percent. As of April 1, 2009, analysts were forecasting a first quarter growth rate of -36 percent. That noted, the first quarter marked the first time the S&P 500 has recorded seven straight quarters of negative growth since Thomson Reuters began tracking the data in 1998. And, though companies are beating expectations, the fact remains that all ten sectors that comprise the S&P 500 index are expecting earnings to decline in the second quarter. Telecom companies in the S&P 500 index had a minus three percent growth rate in the first quarter. While discouraging, telecom companies experienced nothing like the negative 95.5 percent decline for consumer discretionary companies or the negative 59 percent showing for energy firms or the negative 60.8 rate of financial companies. Telecommunications is a business of scale, requiring huge capital investments. So it should not be surprising that the number of contestants is limited. In the legacy wired voice markets, it once was an ironclad rule that the Regional Bell operating companies represented about 90 percent of lines in service. In the U.S. wireless market, just four providers have about 90 percent market share. As discrete video, wireless, broadband and voice markets start to merge, different names will start to appear. And it is conceivable that the share held by the few providers with the most share will broaden. Something more like a classic "80/20" distribution could occur, where 20 percent of providers hold 80 percent share. What seems unlikely is that the roughly "L" shaped curve will change. You would be hard pressed to name a single business category (subscribers, profit, profit margin, revenue) where such a distribution is absent. The obvious strategy inference is that if one is not likely to be found among the ranks of the 20 percent with 80 percent share, one had better have a clear niche. Geography, packaging, price, lead application, user interface, device, channels, customer segment or intangibles are typical ways providers differentiate. In a service provider business spinning off more than $1 trillion annually in revenue, even small niches, fairly far out on the "tail" of market share, can be big businesses. Is TV Advertising Permanently Broken? TV networks typically get orders for $9 billion or so (nearly half of total annual advertising) in advertising commitments during the "upfront season," and, as you might suspect, expectations are somewhere between shockingly low to dangerously low. Some estimate the major broadcast networks might wind up getting $7.5 billion, a slide of between 13 to 20 percent. New media is part of the reason; new ad targeting capabilities another. Anticipated dips in consumer spending likely are another reason. People aren't buying cars or financial products at the moment, so some advertisers seem to be scaling back their expectations for what advertising can accomplish, at least in the network TV channel. So the issue, stated or unstated, is whether the change is temporary or secular (permanent). Certainly supporters of online or other targeted advertising channels would hope for the latter. Some would argue that even if economic deterioration abates, there is no evidence that consumers and advertisers will revert to their previous spending habits. So the issue is: is spending for network TV advertising on the cusp of a permanent, negative change, in large part because Web, targeted, mobile and online alternatives are becoming viable? BlackBerry users now can add contact information embedded in emails directly to their contact managers, with a single click, using "gwabbit for BlackBerry," now available a BlackBerry App World, Research in Motion's app store. The app also can be downloaded from www.gwabbit.com. The app can add and update information in the BlackBerry Contacts or Microsoft Outlook directories. The "gwabbit for Outlook" app, released earlier, automatically identifies signatures in incoming emails and creates them as new or updated contacts on a desktop or notebook PC. gwabbit for Outlook is available for a single, one-time fee of $19.95. The two products together deliver complete email contact management for any professional on the road or at their desk. Gwabbit is now available for all BlackBerry smartphones including the BlackBerry Bold, BlackBerry Storm, BlackBerry Curve series and BlackBerry Pearl series of smartphones. More than 48 percent of U.S. adults believe that a lack of advertising by a retail store, bank or auto dealership during a recession indicates the business must be struggling says Ad-ology Research. Likewise, a vast majority perceives businesses that continue to advertise as being competitive or committed to doing business, a recent survey suggests. “It is critical to advertise in the current economic climate, to maintain long-term positive consumer perception of your brand,” says C. Lee Smith, president and CEO of Ad-ology Research. “Advertising not only assures consumers of a business’ reliability in a soft economy, but it can influence where and what they buy, especially when the ads address concerns about value,” Smith says. "Easy to use" mobile phones are a demographic "evergreen" market segment, Swedish consumer electronics company Doro believes. In some cases it’s not a matter of whether customers are actually able to use a device, but rather they resonate with the image that the product conveys. But there are some important design considerations. Larger characters on the phone screen and bigger buttons for dialing numbers are examples. Those with hearing loss can be provided devices that sync hearing aids using Bluetooth and have high quality speakers. Though nobody can predict what will happen when today's BlackBerry and iPhone users age, they might not someday be able to view screens as well as they do today and might need better audio. Maybe the buttons on a BlackBerry will be too small. And later in life, users might not be so busy. In that case, always-available email might not be so important, especially when users are paying for their own service and devices, rather than using company-supplied technology. For today's seniors who have not used iPhones before, it is very likely that many such persons would reject the iPhone simply because of the device’s youth-centric branding. Doro says it has been working with carrier partners both in Europe and undisclosed partners in the U.S. to investigate wireless health applications and other services that could leverage Doro’s easy to use phones. As the wireless market becomes saturated, serving such niches will be more important. MetroPCS and Leap Wireless both reported annual double-digit connections growth in the first quarter of 2009 and in some geographic areas are claiming a greater share of net additions than the big four mobile providers. Both are doing so on the strength of unlimited prepaid plans, a strategy Sprint’s prepaid affiliate Boost Mobile also has adopted. Boost offers a $50 per month unlimited usage plan. MetroPCS and Leap Wireless also are pioneers of the "hybrid" mobile plans that offer a monthly allowance of voice and data but is paid for upfront and does not require a contract. "In the current economic climate, customers are finding their unlimited hybrid plans attractive, particularly as the plans are free from any long-term contract or credit checks," says Will Croft, Wireless Intelligence analyst. Online video consumption grew 13 percent in the first quarter while mobile video viewing grew 52 percent year over year. So you might think linear TV viewing decreased. Not so, says Nielsen. In fact, linear TV viewing grew 1.2 percent year over year, even as consumption of other forms of video, on different platforms, grew. The average American watches approximately 153 hours of TV every month at home. In addition, the 131 million Americans who watch video on the Internet watch on average about 3 hours of video online each month at home and work. The 13.4 million Americans who watch video on mobile phones watch on average about 3.5 hours of mobile video each month. Out of all different age groups, 18-24 year olds show signs of watching DVR and online video the same amount of time - timeshifting 5 hrs, 47 minutes per month, and watching video online 5 hrs, 3 minutes each month. Video-based conferencing services are not the only unified communications service business customers are looking to buy, but they seem to assumed a "lead" application status recently. That, at least, is what respondents to a recent Yankee Group survey indicate. 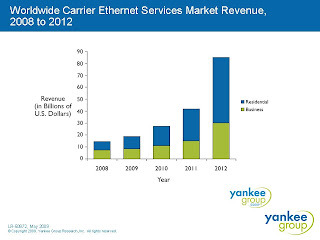 You might think the carrier Ethernet market is a product category driven by business customers. But Yankee Group analysts predict that most of the market will be driven by services sold to consumers, not businesses, beginning this year. That is evidence of the new role for Ethernet used to support broadband access and digital video services. 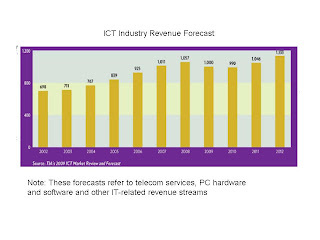 For the first time in its 23 years of forecasting for the information and communications technology industry, the Telecommunications Industry Association is projecting a 3.1 percent decline in revenue for the overall global ICT market in 2009. In the United States, revenue will suffer a 5.5 percent decline in 2009. Some will read the numbers and translate that into a dip in telecommunications spending, but that is not what the headline number indicates. The TIA is talking about the ICT industry, not the telecom service provider industry. In fact, roughly 70 percent of the ICT data refers to things such as sales of computers, information technology consulting, PC and other software and services related to creating, modifying or maintaining data networks, on the premises. For example, the TIA forecasts a dip in U.S. revenue from about $1.1 trillion in 2008, dipping to about $1 trillion in 2009, falling to $990 billion in 2010. But according to the Federal Communications Commission, total U.S. communications service provider revenue in 2008 was about $300 billion. So roughly $700 billion of total ICT revenue is from hardware, software and services related to computing. The data I have access to does not break out forecasts for the U.S. communications service provider industry. But I would be very surprised if industry revenues failed to grow in 2009, compared to 2008. It now appears 2009 and 2010 will not be happy years for suppliers of equipment and software to many segments of the global telecom industry, though investments in backbone capacity, IPTV, mobility and VoIP will be salient exceptions. Releasing its latest market forecast, the Telecommunications Industry Association predicts U.S. carrier capex spending will be down 13 percent in 2009, compared to 2008. Global capex spending will dip about 3.1 percent, TIA says. A recovery in spending will occur in 2010 and 2011, TIA now projects, and U.S. capex will climb about 14.4 percent when the rebound happens. As you might expect, spending will vary by segment and by growth prospects in each segment. U.S. landline infrastructure spending will decline about 11 percent in 2009, but there also will be a 15 percent growth in backbone spending. Operators will spend about 27 percent less on access. Spending on wireless infrastructure and broadband will climb, however. Indeed, spending on IPTV and VoIP will grow 42 percent in 2009. None of these projections address service provider revenues, though, and are limited to capital spending programs by service providers. So far, first quarter 2009 service provider reports suggest service providers, as an industry, are on track to grow revenue in 2009, compared to 2008. Whatever else might happen with the broadband stimulus program, odds are that the spending of those funds will increase the amount of competition in rural markets. The reason is simple enough: cable, mobile and fixed wireless service providers are likely to apply for grants under the programs, and it is likely some will receive funding. The American Cable Association, an industry group for small independent cable operators, probably will make a fairly significant play for funds. To be sure, many rural telcos also run separate cable system operations. But even where an in-region telco gets funds to support its in-region cable operation, increased broadband access from the cable unit will dampen demand for telco-provided broadband. It isn't clear whether fixed wireless providers will apply, but there are many hundreds of small Internet service providers using fixed wireless to provide broadband in rural and thinly-settled areas. Also, depending on the final language adopted, larger mobile providers might be able to apply as well. The impact might not be felt immediately. It is possible many competitive networks will get funding to support operations in nearby communities, if not directly in rural areas. But we all know what happens when an incumbent in one area looks for growth. The answer in rural areas tends to be expanding service into adjacent or nearby communities. So stimulus funds might allow providers to fortify their backhaul and other assets enough that later access operations in nearby communities are more feasible. People sometimes think the real "problem" with broadband is that it isn't available. In fact, there is growing recognition that adoption (demand) is the primary issue. And about all it takes to boost broadband usage is to make it easy, affordable and even a bit fun. AT&T, for example, has announced it is adding mobile broadband equipped Acer, Dell and Lenovo netbooks to its standard line of products this summer. AT&T began testing sales of 3G-equipped netbooks in its retail stores in April. Based on the successful results, AT&T is going nationwide. Pricing for the nationally-available offer are not yet available, but AT&T in "limited trials" has been offering a netbook for a $49.99 in Atlanta and Philadelphia test markets. To get that price, users sign a two-year contract for wireless and wired Internet access. In the test markets the Acer Aspire One, Dell Inspiron Mini 9, Dell Inspiron Mini 12 and LG Xenia were available. Prices for the netbooks start at $49.99 and go up to $249.99 with a purchase of AT&T's Internet at Home and On the Go plan, which starts at $59.99 per month. Customers who just wanted the netbooks could buy them for $449.99 to $599.99. A third option, DataConnect only, allowed users to buy netbooks starting at $99.99 and going up to $349.99, with purchase of a 3G DataConnect plan costing $40 to $60 a month. “It’s clear there’s a demand for mini laptops,” says Ralph de la Vega, AT&T Mobility and Consumer Markets president and chief executive officer says. “We’re getting interest from tweens, teens, young adults, moms on the go and small business owners." A poll of 186 industry professionals shows a belief that high-definition voice quality will have greatest impact for video conferencing and conference calling. The Global IP Solutions-sponsored poll also shows that a third of respondents think high-definition voice quality also will benefit overall productivity in the workplace, while 57 percent considered conference calling would benefit the most in a work setting. About 16 percent believe high-definition audio will have greatest impact for call center operations. Some 11 percent of respondents say they use high-definition voice service “all the time or whenever they can” and an additional 30 percent reported having used it once or twice. About 47 percent of respondents have not used it yet. AT&T now is selling enterprises a new "AT&T Synaptic Storage as a Service", a storage-on-demand offer that provides enterprise customers with control over the storage, distribution and retrieval of their data from any location, anytime, using any Web-enabled device. The service automatically scales storage capacity up or down as needed, and users pay only for the amount they use, AT&T says. "Build it and They Will Come..." Again? "Build it and they will come" became a demolished business strategy in the global bandwidth business, even though for a brief moment around the turn of the century, people believed that to be the case. Still, the logic behind fiber-to-the-home projects in many ways represents the same sort of thinking. "New applications will flourish on a 100Mbps FTTP rollout even though nobody knows what those apps will be," says Khoong Hock Yun, Infocomm Development Authority assistant chief executive, and reported by CommsDay. Still, it might still turn out to be correct, at least for providers of access connections, at some point. FTTH Council of Europe President Karel Helsen argues that content, gaming and entertainment companies now aer being invited to join the FTTU Council. “We just had the first gaming association also join the European council and we believe also by having those people as members, you also create the pull effect from the market side to stimulate the rollout of fiber to the home,” Helsen says. That isn't to argue such networks should not be built, or that new revenue-generating applications will not ultimately be developed. But it is likely to take some time. The Supreme Court apparently is going to test the constitutionality of Sarbanes-Oxley rules. Personally, I hope the Supremes do rule that way. Sarbox has been a major burden for smaller and mid-sized firms, adding millions of dollar in annual cost, in many cases, and killing the Initial Public Offering market. If you were trying to figure out how prevalent televisions, radios, digital video recorders, Slingboxes, PCs or DVD players were in people's lives, would it make more sense to measure how many Best Buy retail locations sold such products, or how many units are sold in any given time period? Alternatively, if you were trying to measure the penetration of such devices, would you track the number of homes, businesses, or both, that have such devices in use? Would you try to measure "personal" devices such as mobile phones or MP3 players the same way? The questions aren't as "academic" as might first appear to be the case. While it makes sense to measure the penetration of any mobile and personal technology on a per capita basis, because that is the way people buy and use such services and products, it arguably makes less sense to measure other products, such as T1 lines, Ethernet or other fixed broadband connections the same way, because that is not the way people buy or consume such products. Were we to measure Ethernet connections on a per-capita basis, penetration would be quite low, for example. Most people intuitively would understand that sort of issue. But where it comes to fixed broadband penetration, that is precisely the problem we face. Agencies are used to measuring fixed broadband in just about that fashion: per capita, even though people do not buy such services that way. The point simply is that we need to measure things in a way that reflects the way people actually use a given product or technology. People do not buy fixed broadband subscriptions the same way they buy mobile phones. So per capita indexes are more suited to some products than others. Per-capita fixed broadband indexes are affected by mundane things such as household size, business adoption and consumer preferences. "Consider Portugal, in which there are approximately three persons per household," says George Ford, Phoenix Center for Advanced Legal and Economic Public Policy Studies chief economist. "If every household had a broadband connection, then the per capita subscription rate in Portugal would be 33 percent"
connection, then the per-capita subscription rate is 50 percent." "The number of fixed broadband connections per person is a flawed measure because it will vary based on the average size of a household or business establishment," Ford notes. "In the United States, nearly every business and household had a fixed line telephone when the 1996 Telecom Act was passed," Ford notes. "Yet, telephone subscriptions per capita were only 49 percent at the time." "In Sweden, which also had near ubiquitous telephone adoption, the telephone per-capita subscription rate was 69 percent. The point, says Ford, is that per-capita measures are not meaningful tests of fixed broadband adoption, especially when comparing different regions or nations. Verizon Wireless has increased the data allowance for all mobile broadband customers on its lowest priced monthly plan and also has reduced overage pricing on the standard plan. Users of the $39.99 monthly access plan used to have a cap of 50 Mbytes with an overage charge of 25 cents per megabyte. The new plan includes a 250 MByte monthly allowance and 10 cents per megabyte overage. Users of the $59.99 monthly access plan have an unchanged 5 GByte monthly allowance and five cents per megabyte overage charges, compared to the older overage charge of 25 cents per megabyte. It took nearly six years for third generation mobile services based on UMTS/HSPA to reach 100 million subscribers but it will take Long Term Evolution just four years to reach the same milestone, say researchers at Juniper Research. The number of LTE subscriptions worldwide will grow at a cumulative average growth rate of 404 percent from 2010 to 2014 and reach 136 million subscriptions by year-end 2014, Juniper forecasts. You might think this has something to do with spectrum efficiency, more efficient coding, signal propagation or some other technology attribute, but if the forecast proves accurate, it will be more a result of a changed mobility market than anything else. When 3G networks were launched, the expectation was that new data services would fuel revenue growth. That largely failed to happen, at least early on. What is different now is that mobile broadband is approaching mass market status. Mobile broadband demand is growing about 30 percent a year, while video usage is growing only a bit slower. DPI Raises Consumer Ire, Should it? "Network bandwidth is a finite resource, especially so in wireless networks, so it is reasonable and indeed expected that carriers will manage their network bandwidth to assure sufficient quality of service for all subscribers," says Brian Wood, Continuous Computing's VP. That tends to mean use of deep packet inspection, and that tends to raise hackles in some quarters. The problem is that Internet access, and Internet backbones and servers, are shared resources. There is a "tragedy of the commons" problem if a few users have behavior patterns dramatically different from those of the typical user, because all networks are engineered statistically. Nobody builds a network that provisions bandwidth on a "nailed up" basis, because nobody could afford to do so. Instead, bandwidth is "underprovisioned," on purpose. Network architects assume that not every user will be putting load on the network, all at the same time. That works remarkably well most of the time. What causes problems are unexpected loads that haven't been engineered into the network. "Without traffic management, a few 'bandwidth hogs' can easily degrade the user experience of many other users on the same network," says Wood. That might especially be true in the access network, but the entire Internet transmission network, including all the servers, are shared resources. "For consumers, DPI-based traffic management ensures that subscribers get the quality of service that they expect, or at least that they pay for," says Wood. So, for example, a business user might opt to pay a slight premium for a guaranteed level of service (e.g., guaranteed minimum bandwidth) while a frugal college student might go for a cheaper "best effort" rate plan. Basically, DPI or other traffic shaping mechanisms are about fairness: making sure most users get reasonable performance most of the time. The other advantage is the ability to learn or be instructed by a user on what activities are most important, so those activities get the highest priority during congested periods. DPI can be viewed as an automated away, or a self-learning kind of way, for the network to provide those kinds of benefits, says Wood. "It's all a matter of filtering out the stuff that, based on past behavior or the behavior of similarly-profiled individuals, is deemed to not be of value and, instead, prioritizing the stuff that is deemed to be of value." Behavioral tracking is an issue, though. "Cookie-based tracking seems to be a generally-accepted practice with web sites these days, but there was great concern when cookies were first introduced," says Wood. There are end user advantages, of course, such as sites "remembering" who you are and what your preferences are. Behavior-based tracking has raised more concern. Deep packet inspection is deemed by some as intrusive and too personal, says Wood. The same sorts of concerns are raised about DPI-based ad insertion. "What's interesting to me, though, is that Google has been offering Gmail for free to users in exchange for content-based advertisements being displayed next to their emails, and I haven't heard of any uprising against Gmail," he says. Subscriber notification, how subscribers are notified, and whether those subscribers have any say in the matter, seem to be the key sticking points here, he muses. "Nobody likes the idea of being monitored without their consent, especially if they feel like information gathered through such monitoring will be used in an attempt to profile or manipulate them in the future." But behavior-based marketing seems to work well for Netflix and Amazon, Wood notes. The difference seems to be one of perception. Lots of people are afraid technology will be used "on" them, rather than "for" them. Cutbacks in home communications and entertainment services have yet to emerge as a measurable trend, despite the ongoing recession, say researchers at Pike & Fischer, who recently polled 600 consumers nationwide about their spending on phone, Internet and multichannel video. Scott Sleek, Pike & Fischer director of broadband advisory services, says the firm conducted the survey because it has been hearing so much "doom and gloom" from service provider executives. But the study indicates respondents say they would rather keep Internet, video and voice services in their budgets than any other type of expense, including gym memberships, personal care products and apparel. But the results also point to customers becoming more aware of ways to spend less on those services. That suggests average revenue per user is, or will soon become, an issue for service providers. "We found very consistent consumer behavior," says Sleek. "We found no evidence of downgrading, for example." "What I found interesting was that when we asked what people planned to do with their phone and TV services, most said they were planning absolutely no changes," says Sleek. "Of course, neither are they upgrading, buying more premium channels or adding faster Internet tiers, either," he notes. That is "better than a lot of people thought would happen," he adds. But one reason service provider executives remain nervous is that there are so many free and cheaper services available now that didn't exist five years ago. Nobody was sure what would happen, this time around. So far, though, behavior is what one would have predicted, based on behavior in past recessions: stability of subscriptions, but some pressure on average revenue per user. "The cable guys are worried about over the top video, but so far, it seems to be augmenting video consumption," says Sleek. 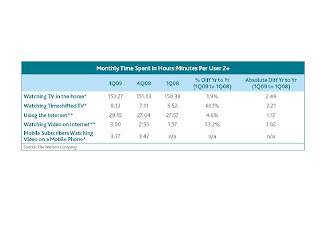 People report spending more time at home, so TV and Internet arguably are more valuable. Electricity consumption by "electronics" grew by nearly seven percent each year from 1990 to 2008, says Paul Waide, International Energy Agency senior policy analyst. And electricity consumption is likely to grow by 250 percent by 2030, as a majority of growth already is coming from non-OECD countries. But use of mobile devices, which is growing rapidly, helps, as mobiles tend to be more power efficient. In fact, says the IEA, matters would be worse but for the convergence of technologies and the growth in mobile applications such as laptop computers, which draw less power. The IEA study finds that over the next seven months, the number of people using a personal computer will pass the one billion mark. Electronic devices currently account for 15 percent of household electricity consumption but their share is rapidly rising. Already there are nearly two billion television sets in use, with an average of over 1.3 sets in each home having access to electricity. Higher efficiency technologies that are already available would half this demand, he notes. So aside from more-efficient technologies, unplugging devices when not in use, unplugging mobiles when fully charged and turning off unused applications such as Bluetooth or Wi-Fi when not needed are steps people can take to limit electrical consumption. One of the issues service providers grapple with when weighing IPTV offerings is the financial return. Many executives who have done so say they actually lose money doing so, and others who think they will inevitably have to jump in likewise expect to lose money. That is one reason some executives think an alternative approach, either based on streaming or downloading, might make more sense. Certainly that is what any number of video distributors are doing, or have done, with modest success. But the economics of movie rental services might ultimately prove just about as challenging. The home video market represents about 54 percent of the U.S. film industry’s $45 billion in 2008 revenues. Perhaps 49 percent of the revenue in turn is generated by DVD sales. Perhaps 21 percent is generated by video rentals. The issue, in part, is that profit margins are higher on sales than rentals, and higher for online-delivered products than physical media substitutes. One wonders how long the content owners will sit by if distributors offering $1 rentals, low cost or even "no additional cost" streaming, continue to gain traction. There just isn't much margin at that price level, for anybody in the value chain. At some point, lots of service providers without the scale economics of AT&T or Verizon Communications might conclude that online video is a "cost of doing business," not a "revenue" item. Total social network ad spending in the U.S. will drop 3 percent to $1.1 billion in 2009, from $1.2 billion last year, says eMarketer, and the falloff is almost solely attributable to what will happen at MySpace. MySpace accounts for nearly half of all U.S. advertising spend in the social networking space. Analysts at eMarketer now forecast that MySpace advertising will fall 15 percent in 2009, compared to 2008. MySpace booked an estimateed $585 million in advertising in 2008, but will earn just $495 million this year, down 15 percent from last year. Facebook advertising and widget placements do not seem to be affected, eMarketer says. Facebook advertising is expected to grow nine percent in 2009, to $230 million. Ad spending on widgets and applications also will climb $70 million in 2009, up 75 percent from the year before. In general, U.S. ad spend on all other social network sites combined is expected to rise abou one percent to $345 million. This is a major reversal, but perhaps to be expected, given the overall economic climate. Spending grew an estimated 33 percent in 2008 and 129 percent in 2007. 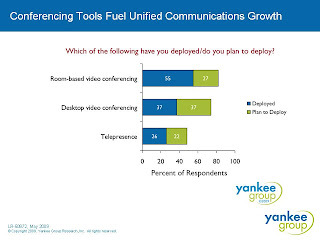 60% Unified Communications, Video Adoption by 2010? Some 60 percent of enterprise executives polled recently by Network Instruments say they will have implemented unified communications capabilities at their organizations by 2010, while 57 percent say they will have implemented video solutions by 2010. Some 66 percent of the 442 network engineers, IT directors, and CIOs in North America, Asia, Europe, Africa, and South America also report they will have teleconferencing solutions in place by 2010. VoIP adoption continues to rise, as 75 percent of companies will have installed VoIP by the end of 2009, compared to 61 percent in 2007. One has to interpret such findings. When enterprise executives are asked whether they will deploy a given technology, it does not mean they will deploy throughout the entire enterprise. Also, plans typically slip a bit; rarely are they accelerated. That's about the only way to make sense of survey findings that often show a third of respondents plan to do something "within the next 12 months," virtually every time a survey is taken. Australian incumbent telco Telstra would be split in two if a government proposal is accepted voluntarily. Under the deal, the Australian government would offer Telstra the chance to buy up to 49 per cent of a new national broadband network if Telstra agrees to separate itself into a wholesale access company and a separate retail service provider business. In a first step, Telstra would be "functionally" separated into a wholesale access company and a retail business. As part of this deal, where Telstra would still own both businesses, Telstra would have the chance to buy as much as 20 percent of the new broadband access company to be formed, but would contribute its present optical network to the new entity. Such approaches to stimulating broadband competition are in place in the United Kingdom and coming in Singapore, with both Australian and New Zealand regulators looking at the concept as well. Such institutional frameworks would allow a different answer to the question "can a service provider make a business out of dumb pipe" than is conceivable in North America or most other markets globally. By definition, one provider would sell broadband access connections to all other retail service providers. Global Android smart phone shipments will grow 900 percent in 2009, say analysts at Strategy Analytics. Of course, very-rapid growth on a percentage basis often is possible for firms, services or products starting froma very-low installed base, but the growth forecast is indicative of a product expected to gain market acceptance. The Apple iPhone operating system will be the next fastest-growing smartphone operating system in 2009, with a 79 percent growth rate, Strategy Analytics says. "Android has fast been winning healthy support among operators, vendors and developers," says Neil Mawston, Strategy Analytics director. "A relatively low-cost licensing model, its semi-open-source structure and Google's support for cloud services have encouraged companies such as HTC, Motorola, Samsung, T Mobile, Vodafone and others to support the Android operating system." The upshot: "Android is now in a good position to become a top-tier player in smartphones over the next two to three years," Mawston says. Pingo Business, the prepaid VoIP calling services from iBasis, has reduced calling rates to Mexico by 50 percent for consumer and small and medium-sized business (SMBs) customers, through May 31, 2009. The move is a response to the recent H1N1influenza outbreak in Mexico, which has caused shutdowns in businesses and services, prompted airlines to severely curtail flights in and out of the country. With travel to Mexico also the subject of warnings from the Centers for Disease Control and Prevention, Pingo Business believes the temporary program will help businesses maintain operations. Digital divides in developed economies are less about limited broadband availability and more about a lack of broadband demand and complex interfaces, say analysts at Ovum. In that that regard, Ovum joins a growing number of policy advocates who now recognize there is a difference between broadband availability" and "broadband use." Though there clearly are some locations, largely in rural areas, that do not yet have a choice of wired providers, most rural U.S. locations, for example, can receive satellite service from two providers, HughesNet and WildBlue. And as many as 96 percent of U.S. homes can receive cable modem service, while 90 percent or so of U.S. locations can get digital subscriber line service from a telephone company as well. “There has been significant focus on the limited availability of broadband as the main factor in creating digital divides” says Charlie Davies, Ovum senior analyst. "In fact, Ovum, as well as other consumer surveys and studies, have shown other factors such as a lack of demand as being a more significant barrier”. That's an important distinction, since solving a problem requires defining accurately what the problem is. One might argue that not enough people buy BMWs because they can't get to a nearby dealership (an access problem). One might alternatively argue that more people do not buy BMWs because it isn't the right vehicle or because it costs too much (a demand problem). Observers increasingly are acknowledging that demand, not access, is the main problem, though some areas are remote enough that physical access by wired facilities remains a problem. In many developed markets, broadband penetration is now well over 50 percent but overall broadband growth is slowing, despite the fact that broadband availability is at an all-time high. Ovum says this situation is due to a significant minority of people not being interested in taking up broadband, or other significant barriers in doing so (not interested in using the Internet, not owning a PC, not knowing how to use the Internet or not able to, or willing to pay for service, for example). "Many people without broadband or the Internet are put off by overly complex devices and interfaces that cater to the technically literate," says Ovum. "In addition, users with disabilities are largely under-served." The cost of using the Internet also is a barrier. So demand stimulation, not physical access, is the chief impediment to higher broadband usage. Among respondents that do not currently use video conferencing, 68 percent say expections they can save money on travel expenses is the most important factor driving their adoption of video conferencing in the next 12 months, says In-Stat. One might safely assume the recession, and the desire to cut discretionary expense, accounts for much of the current interest. Some 57 percent of decision-makers indicated their organizations have formal video conferencing policies in place and those policies are designed to maximize return on the video conferencing investment, particularly when it can be used to mitigate travel, says In-Stat. BT Model for United States? Competitor mandatory wholesale access to voice and broadband access services has been good for BT and the United Kingdom, and might be useful in the United States, says Sir Michael Rake, BT chairman. Though rules are not completely finalized for new optical access lines, BT's massive loss of market share in the landline voice and broadband access markets has forced the company to be more aggressive about new services, he says. "It was painful at the time but has been better for the country and consumers in the long run," Rake says. Today, BT generates annual revenues of about 20 billion British pounds, the same as five years ago. Accounting for inflation and new services, one might argue the results have been negative for BT, as good as they have been for retail consumers. The average speed for broadband access has nearly doubled to 2 megabits a second and the price for service has been reduced by an average of 50 percent from five years ago. The best way to get more people to adopt high-speed Internet is to create competition through a regulatory framework that forces the biggest players to open their networks, Rake argues. Get ready for the broadband stimulus fire drill. Sometime in June, the thinking goes, the National Telecommunications & Information Administration and the Department of Agriculture's Rural Utilities Service will issue the required Notice of Funds Availability (NOFA) outlining criteria and application processes for the $7.2 billion in "broadband stimulus" funds the agencies will be disbursing, presumably in three rounds. It now appears there will be separate NOFAs. "There will be separate NOFAs," says MarkTolbert, NTIA spokesman. "To my knowledge, NTIA and RUS will each issue their own NOFA." Verizon Communications has signed a deal with DSL Extreme allowing that firm to resell Verizon's FiOS Internet service in 17 states. The move is important for several reasons. Most observers think wholesale access on incumbent access networks is a key underpinning for a wide range of competitive offerings, and the status of such access when access loops are converted to optical technology remains unsettled. Most observers might agree that Verizon's move also helps it counter mandatory access regulations. Verizon and other service providers have opposed mandatory access rules that do not offer a reasonable return on investment, preferring voluntary business arrangements. Others will argue that Verizon's move aims to head off such regulations by providing some degree of wholesale access, to some providers, but in ways that protect wholesale margins. Time Warner Cable did something similar with its wholesale broadband efforts, allowing a few competing providers access, but not to any and all other contestants. DSL Extreme's Fiber Extreme is now available to 10.4 million households in 17 states where FiOS Internet service is available, including California, New York, New Jersey, Pennsylvania, Texas, Virginia and Washington. Introductory residential pricing for Fiber Extreme is $99.95 per month for up to 50 Mbps; $54.95 per month for up to 20 Mbps; and $39.95 per month for up to 10 Mbps. It is uncertain how this move will affect later wholesale access to FiOS broadband facilities, or even what positive impact might ultimately result for broader support of broadband competition on a voluntary or mandated basis. What is clear is that DSL Extreme will have ample opportunity to add on its own applications and value to the "dumb pipe." No question about it: mobile marketing has to be "pull" rather than "push" oriented. Otherwise, it's pretty close to spam. But I think most people have got that figured out. Is There a "Dumb Pipe" Business Model? No question so occupies wired network service provider attention as the recrafting of the business model known as the "dumb pipe." In some ways, it is an unusual question, if only because virtually all retail service providers say that is the one way they will not plan to grow their businesses. If anything, virtually every executive wants, where feasible, to "move up the value chain," adding more value and functionality, not less. There are isolated examples of "dumb pipe" models, such as in Singapore, where a new wholesale-only network access company will sell service to all other retail providers. There are more examples of hybrid models, where a functionally separate wholesale entity provides services to all retail providers, but where actual ownership of the assets might remain with a former incumbent or new provider. Virgin Media, for example, has at least considered offering other retail providers wholesale access to its access network, though company executives publicly deny a recent report that it has concrete plans to do so. So wholesale is the only area where there might be some modicum of serious debate is over the role of wholesale services. And in most cases, the only reason wholesale is a subject of serious investigation is because regulatory authorities have forced service providers to operate in a robust wholesale environment leading to huge loss of market share. That said, in most cases it quickly will become obvious that "dumb pipe" operations have to be managed just as any other element of the business, but cannot, in and of themselves, support all the current or future operations of a service provider business at a time when the current revenue base is eroding. Whatever one might say, it seems generally clear that "dumb pipe" can be a business for a wholesale-only entity, but not so clearly, thus far, a retail operation. Even some firms that have tried the wholesale-only route typically wind up getting into their own retail operations as well. So far, executive preferences notwithstanding, market experience tends to suggest there are some successful "dumb pipe" business models, primarily found in the wide area network backbone, where "capacity" is the product, and some limited evidence that wholesale-only access opportunities may exist where regulators require it. So far, though, in the retail, end user business, dumb pipe has not yet proven to be sustainable. Social media are just different. You can argue about who "owns" the content on YouTube, on blogs or Web sites in general. In a strict legal sense, you can come up with an answer. In a broader sense, much "ownership" these days is shared. A particular site might "own" a certain piece of content. But creators can opt out and withhold their content. A company might own, in some sense, the content hosted on its site. That company might own the rights to monetize that content. But content creators also are provided "no incremental cost" rights to create their content. They also have the right to remove the whole site, at will. So at some level, who "owns" it is not the question. To some real extent, all social media is a cooperative venture for everybody who wishes to contribute. No matter who "owns" a site, the value increasingly is created by the people who choose to contribute. Wireless and broadband subscribers will grow at over 10 percent per year over the next five years, says TeleGeography, with a net 2.5 billion net new subscribers by the end of 2013. But average revenue per user will grow more slowly, at a five percent annual rate, in large part because the bulk of the new customers will be gotten in developing regions where subscription and usage fees will be lower. The bulk of subscriber growth will come from countries where GDP per capita is under $3,000 a year, with obvious implications for retail pricing. For those of you who have followed global communications industry for any length of time, this is a surprising development, as policymakers have for decades lamented the slow pace of communications development in much of the world. These days, the use of mobility to rapidly increase both voice and broadband consumption is nothing short of breathtaking. The corollary, TeleGeography says, is that service providers with significant exposure to developing markets will fare better in acquiring those new customers. Service providers operating in multiple geographies will do even better, TeleGeography says. Qwest Communications has joined the ranks of service providers for whom the Wi-Fi hotspot business model is cable modem or digital subscriber line service. The move also illustrates the growing trend to offer broadband access irrespective of how a network provides that access. The next step for some providers will be broadband subscriptions that cover fixed or mobile access. For Qwest, the new features add a key mobility element for its fixed service. Qwest broadband access customers now have free, unlimited nationwide access to Qwest Wi-Fi offered at 17,000 hotspots, powered by the AT&T Wi-Fi network. A recent survey Qwest sponsored found nearly half of all respondents valued Wi-Fi because it provided them with the freedom and flexibility to stay connected beyond the home or office. In other words, users increasingly expect Internet access wherever they are. "Our study showed that nearly half of all respondents get ‘antsy,’ in about an hour, if they can’t check e-mail, social networking sites or instant messaging," says Dan Yost, Qwest executive vice president. California Wants $1 Billion in Broadband Stimulus Funds? The good news is that 96 percent of California's households have access to a high-speed Internet connection, some note. The bad news is that 45 percent of Californians choose not to buy broadband. Still, California officials are said to be contemplating asking for as much as $1 billion of the $7.2 billion in national broadband stimulus funding. For demand stimulation, possibly. The U.S. mobile market behaved differently from most of the rest of the world in the fourth quarter of 2008: most markets saw revenue declines; the United States did not.. Mobile end-user average revenue per user dropped between five percent and 15 percent globally in the fourth quarter of 2008, year-over-year, according to researchers at ABI Research. China, India, and a number of other Asian markets dropped more than 10 percent. In Europe the ARPU contraction was in the range of five to eight percent. But in North America, ARPU grew, on the strength of mobile data revenues. In South America, markets were more mixed with some markets deflating inline and others, like Brazil, managing to hold up ARPUs, says ABI Research. 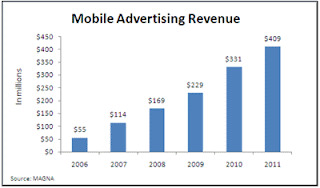 To be sure, mobile data revenues are growing in virtually every market. Mobile data (messaging and mobile Internet) contributes 38 percent of Japanese ARPUs, and many European operators depend on mobile data for over 25 percent to 30 percent of their ARPU. One can only speculate about why the U.S. market has behaved differently. Perhaps, despite the recession, consumers have more discretionary income. Perhaps pricing models are such that variable usage reductions are less attractive. Maybe there is something different about the demand curve for mobile Internet. Whatever the reasons, the U.S. mobility business was somewhat atypical in the fourth quarter. The 8th U.S. Circuit Court of Appeals has upheld a lower court ruling that Vonage is not a telecommunications service provider, and is not required to contribute to the Nebraska Universal Service Fund. The logic, of course, is that independent VoIP companies such as Vonage provide an “information service” rather than a “telecommunications” service. But the regulatory regime has to be considered unstable. Cable companies do pay into the USF fund, for example. Also, the time is coming when lots of portals, Web sites and other providers will be offering such information services. At some point, the typical regulator test--if it walks like a duck, and talks like a duck, it's a duck--will have to be addressed. The regulatory wall between "information services" and "communications services" is going to be hard to maintain, long term. The U.S. market for mobile advertising will grow 36 percent, increasing from $169 million in 2008 to $229 million in 2009, according to a new forecast by Interpublic's Magna. That's a downward revision from the company's previous forecast for mobile ad growth in 2009, primarily due to the brutal economy. The sheer number of mobile devices in use, about 270 million at the end of 2008, according to the CTIA, is one driver. The mobile Web is the other driver. In January, 22 million individuals accessed the mobile Web daily and 63 million monthly, up from 11 million and 37 million for each frequency during January 2008, Magna says. The report found that smart phones are key to growth. About 32 percent of AT&T Wireless contract subscribers owning such a device at the end of the first quarter of 2009, more than double that of the previous year, for example. About 74 percent of small U.S. business-to-business advertisers are either increasing spending over 2008 or keeping it level, according to an Outsell survey of 1,019 U.S. and U.K. advertisers. About 26 percent of these smaller companies are reducing budgets, in contrast with the 40 percent of large B2B advertisers who forecast cuts. But here's an interesting angle, something other surveys also are showing: small firms increasingly see spending on Web sites as "advertising" and Web site spending is the largest single category of online expense. Spending on their own Web sites remains the largest item for B2B advertisers, at 59.1 percent and 51.1 percent of total online budgets for small and large firms, respectively. Online marketing/ad spending is growing among U.S. B2B companies in general—up 8.2 percent from last year among smaller firms, and up 0.4 percent for larger ones. Small U.S. B2B companies are also growing spending more than 10 percent each for keyword buys on search engine sites, e-mail marketing, industry-specific sites, and webinars. Inflection points--times when a rate of growth or decline shifts to a different trajectory are key business events. More startling by far as quantum shifts, where an entire business model either takes off or collapses. The basic business lesson is to recognize that when whole new markets are growing, while legacy businesses are declining, one can go for longish periods of time where the change seems to be simply quantitative. You see slightly more of the new stuff, slightly less of the old stuff, but within a business environment that seems stable. Then the quantum shift occurs and something entirely new appears, as in a flash. That's pretty much what is happening now, in the print media space. But lots of other businesses have some exposure to quantum shifts. Just about anything touched by Internet Protocol or bandwidth has at least some exposure to sudden quantum shifts. To be honest, those of us who make forecasts always use linear thinking. Excel forces you to do that. Most of the time that works. Except when a quantum shift occurs. Then everything changes, very rapidly. Sort of like water changing to ice, or water to steam: one minute you are dealing with one sort of element; the next moment, it is something else. 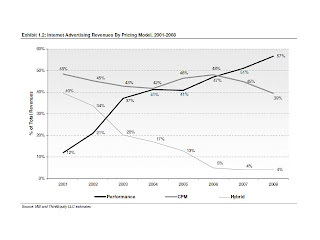 Non-premium display advertising (often known as "remnant" inventory) is likely to remain the highest-growth segment of online media over the next five years, with the greatest potential to create significant opportunities and market dislocations, say ThinkEquity analysts William Morrison and Robert Coolbrith. Premium display includes graphical display advertising inventory sold through a direct sales force such that ad placement, impression volume, and time-frame within which the advertisement will run are guaranteed. Non-premium display advertising is sold without specific time-frame or placement guarantees, typically by a third party. Historically, there has been an order of magnitude to 20 times price differential between premium and non-premium channels. "On a percentage basis, we expect non-premium display to be the highest-growth category in online media, through a combination of significant volume mix shift and pricing growth versus other media types," they argue. Also, look for big changes in the ecosystem. Online advertising exchanges should eventually come to dominate the inventory aggregation function traditionally performed by online advertising networks, although some networks' proprietary inventory aggregation channels should remain relevant in niche and high-value market segments, ThinkEquity says. capturing the overwhelming majority of the non-premium market. optimization, and arbitrage, ThinkEquity notes. The premium CPM (cost per thousand) advertising segment has been losing market share to performance-based advertising (typically to non-premium inventory) since 2001, with the share shift accelerating during the past three years, ThinkEquity says. 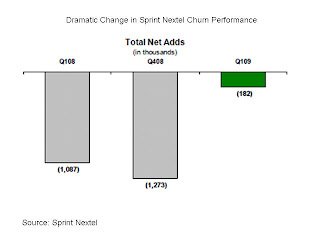 Not often will you see a sequential change in subscriber additions as Sprint Nextel saw between the fourth quarter of 2008 and the first quarter of 2009. That isn't to say Sprint Nextel's churn problems are behind it. The company apparently still is losing customers to AT&T and Verizon Communications. But Sprint Nextel got a boost from Amazon Kindle users and prepaid customers. In principle, an increase in prepaid, at the expense of postpaid, should put pressure on margins. So far that does not seem to be a problem. All in all, though, the first quarter was impressive, at least on the metric of net customer additions or losses. If Sprint Nextel can follow through in the second quarter, it might be an inflection point. A couple of tips for mobile marketers: bite-sized chunks of entertainment work. Ask users to send in photos from their mobiles. Offer an incentive. Incentives such as access to weather, news alerts, local event information, mobile content or even a coupon increase take rates and consumer participation. And many campaigns take advantage of interstitial time; those short blocks of time that happen all day when users have a couple of minutes of downtime or waiting. Late last year, the Army National Guard launched a nationwide in-theater advertising campaign featuring "Warrior," a two-and-a-half minute music video by Kid Rock, and an appearance by NASCAR driver Dale Earnhardt, Jr.
As part of the campaign, a mobile Web site allowed movie watchers to access and interact with the "Warrior" site on their mobile phones while sitting in the theater. "Warrior" appeared for a two-month period before PG-13 and R rated movies in more than 3,000 theaters nationwide. During the campaign, the mobile site saw over 50,000 page views and an impressive level of engagement from mobile users who often downloaded and viewed the multimedia content multiple times as well as shared it with friends. Information security tops a list of projects information technology executives expect their firms to invest in this year. Some 43 percent of surveyed IT executives say they will do so, says Robert Half Technology. Voice over Internet Protocol investments will be undertaken by 26 percent of respondents. Some 28 percent say virtualization initiatives will be funded while data center efficiency was cited by 27 percent of respondents. You might be surprised that so many enterprise executives are planning VoIP initiatives of one sort or another, this year. That's almost as many as those saying they will undertake data center virtualization efforts. SIP trunking will grow at 89 percent cumulative average growth rate between now and 2013 says Diane Myers, Infonetics directing analyst. The converse is that we might finally be seeing the peaking of T1 services as the mainstay of business bandwidth. To be sure, SIP trunks are a replacement for channelized T1s used to support voice termination and origination operations. But even on the Internet access front, midband Ethernet services now are approaching price points that make them reasonable substitutes for data T1s, in some markets. In 2008 the VoIP services market grew 33 percent to $30.8 billion. For the first three months of 2009, hosted IP service providers experienced an average of 40 percent to 50 percent year-over-year growth, says Myers. "We expect hosted unified communications services to take off, with worldwide revenue doubling between 2009 and 2013," she says. While residential VoIP services make up the bulk of VoIP service revenue, business VoIP service revenue growth outpaced residential in 2008, she says. In 2008, managed IP PBX and hosted IP Centrex/hosted UC revenue together accounted for nearly three quarters of all business VoIP service revenue while IP connectivity service revenue made up the balance. 100 Mbps is Really Nice: How Many Really Need It?